Raiding the “New Releases” shelves at the Lockport Library, I ended up bringing home a new book that grabbed my attention as soon as I picked it up. The Oracle Year by Charles Soule was that book. Reading the back cover summary, this book had an intriguing premise that could go in several directions. It could end up being a political thriller, a sci-fi adventure, or something completely different. Will Dando, a struggling musician, wakes up one morning with the ability to predict the future. Armed with 108 predictions, Dando and his friend set up the Site and disguise the predictions as coming from the Oracle. The duo start selling the more sensitive information to the highest bidder, raking in millions and billions of dollars from around the globe. In the meantime, high ranking officials race to find the source of these predictions. Dando keeps his identity secret with layers of security. As more of his predictions come true, he starts to have second thoughts about keeping all that important information to himself. After his identity is finally uncovered by the US government, the race is on to protect his friends, both old and new. Will he be able to outsmart the brightest minds in the government and finally figure out the meaning of the last prediction before it’s too late? From the outset, the pace of the narrative is quick. We move from moment to moment, between Dando struggling to understand being the Oracle, and all the parties out to control him. All the different players in the book have the same agenda with varying paths to the same conclusions. How they all get there and the interactions and consequences thereof make for a fantastic read. Every time the feds corner Dando, he is surprisingly adept at slipping away. The whole time I was reading this book, I wavered between wondering if there was a scientific reason behind Dando’s premonitions or whether it would fall into science fiction. In the end, we’re never really told, but the book did finally fit into the political thriller category. I like books that keep the reader guessing, and this one did. This book was hyped as Amazon’s Best Book of April 2018. Generally, I find the books on that list to not live up to the hype. Thankfully, this one did. What made this thriller so good, in my opinion, is Dando. This protagonist is relatable. He’s not the super-pumped, Matt Damon protagonist. Dando is one of us, Everyman. It takes the story out of the flash of the unattainable and puts it in our world. That makes it even more fun. 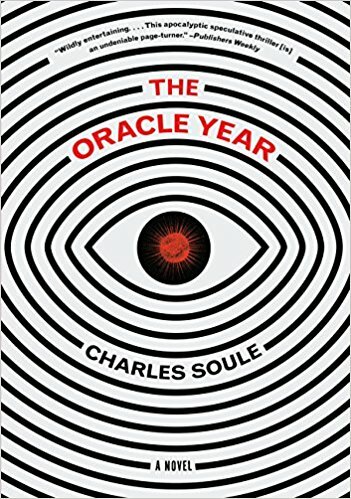 It is well worth your time to take a chance on Charles Soule’s The Oracle Year. This one will make you think from start to finish. And once you’ve finished, you’ll take a deep breath and eagerly await the next book. Craig Bacon wishes his superpower was to fly. He can fly in all his dreams. Also, he’d like to be able to speak and understand any language at any time. He’s not sure he wants to know the future, though.